Sam Dundas has proven that getting involved and challenging yourself can yield remarkable results. The second-year Commerce student, originally from Calgary, chose university across the country for that very purpose. “The farther I go from home, the higher likelihood that I will have to step out of my comfort zone, meet new people and challenge myself,” says Sam. Since coming to Dalhousie, Sam has had opportunities to speak at conferences across the country and discovered his true passion, entrepreneurship. Sam says he has always been an entrepreneur. “I think I’ve just recently come to accept it,” he adds. The young businessman had a paper route at age 11. By 14, he was working at Earl’s, a chain restaurant on the west coast. At Earl’s, Sam became so keen on learning more about the business that he wanted to personally meet the president of the company. Sam’s most recent endeavors have him transforming his entrepreneurial dreams into reality. Sam is actively working on a mobile app project, as well as a product idea with his brother, Jack. With support from the Norman Newman Centre for Entrepreneurship, they have been set up with patent lawyers, market specialists and faculty advisors to put the idea in motion. Jack is an engineering student at the University of British Columbia, so the duo has dubbed their company ‘Coast2Coast Inc.’ “It’s always been my dream to work with him,” Sam says. During his first year at Dalhousie, Sam was eager to meet new people and get involved in campus life. Dalhousie Management Career Services played a big role helping him accomplish this. “They put on a lot of events, like an interview competition which got me started, and then the biggest thing was JDC,” Sam explains. JDC (Jeux du Commerce) Central is Central Canada’s largest business school case competition, bringing together over 700 delegates from 14 Canadian business schools. During the three-day event students compete in academic case competitions, parliamentary style debates, sports tournaments and social competitions. The team that performs the best overall takes home the prestigious “School of the Year” title. “It’s kind of like the Olympics of Canadian universities,” Sam says. In the academic component of the competition each team is given three hours to solve a business case and build a presentation of their recommendations. In preparation, JDC members at Dalhousie practice a case each week leading up to the competition. 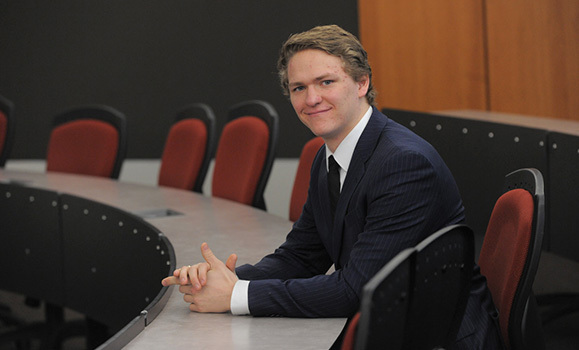 Through JDC, Sam found himself involved with the Dalhousie Investment Society. The society, which runs a mock hedge fund of $100 million, gives members the opportunity to apply skills gained in the classroom to a real life scenario. Last year, a speaker came to talk to the society about an opportunity to present at the Institute of Advanced Financial Planners Trust Advisory Symposium. They were asked to build a pitch around the question of how financial planners and advisors can appeal to millennial clients. The best pitch would be chosen and awarded a trip to Niagara Falls to present at the conference. Although the competition was aimed at third-year students, Sam and two friends, Bryce Cross and Kyle MacLean, submitted a proposal and two weeks later found out they had been selected. The success of the speech led them to Calgary, where they were invited to speak at a wealth management firm. Speaking engagements have allowed them to create countless connections and contacts in the business community. Sam is currently completing his first co-op work term with Deloitte in Toronto, gaining valuable insight into the operation of big corporations. Juggling co-op, conferences and new business ideas, Sam is not saying no to any opportunities that come his way. “Operating, managing, and leading. Leading is one of my biggest strong suits. It’s what I love doing. I just love collaboration and working together.